It's been a few months since I've talked about the Prismatic Art Collection, so today on Ada Lovelace Day, it seems appropriate to give you all an update. Prismatic Art is led and organized by Tracy Hurley with a teeny bit of art direction from yours truly. The Prismatic Art Collection seeks to increase diverse depictions of heroes in popular art. Part of that mission involves hiring more women and artists of color, thereby increasing diversity among professional artists, too. I'm happy to say both objectives are progressing very, very well. 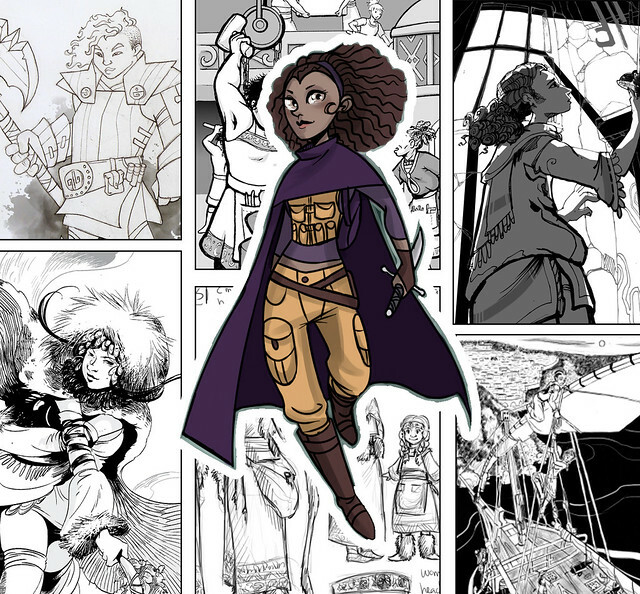 Since the call for artists in March, and successful Kickstarter in late May, the project is moving along at a steady pace. We've gotten into a nice rhythm where artists send early sketches to Tracy, she sends 'em to me for some quick feedback, and the artists then finish up the piece. The collection got a major donation of art from the game Farewell to Fear, which greatly enhanced our offerings. All the art Prismatic commissions or collects is then released on a very open Creative Commons Attribution license, so feel free to use them in your own products. Most of the art up right now is black and white or small color character studies, mainly because that was fastest. We have some more pieces coming from some big name artists, including Hugo Award-winning Ursula Vernon and Julie freakin' Dillon. Most of the the current funds are accounted for, so I'm not sure if the collection is commissioning anything new for a few months. If you have some art in an old sketchbook or unpublished character art you'd like to donate, holler at us on Twitter @PrismaticArt or email prismatic_art at sarahdarkmagic dot com. There's been some really nice stuff so far. Yes! I've been really excited to see how much people have shared so far.